From time to time we offer guest blogs on Barbecuebible.com. This one comes from a chef that we at BarbecueBible.com admire greatly, Matt Jennings, author of Homegrown: Cooking from My New England Roots. His restaurant Townsman in Boston garners significant acclaim for its bold, New England-inspired flavors. We think you’ll see why when you try his recipe below for Grilled Chicken Wings with Cider Barbecue Sauce. Matt, an avid football fan, knows from experience that they’ll make you a winner at any tailgate party this fall. I’m going to let you in on a secret: contrary to what every sports bar in America asserts, the best chicken wings don’t come out of the deep fryer, but off the grill. These wings are marinated overnight in spiced citrus juice, which tenderizes and flavors the meat, and the sugar in the marinade caramelizes when the chicken is cooked. Though the wings are flavorful enough on their own, serve them with a tangy apple cider and molasses barbecue sauce alongside, since every wing deserves a dip. 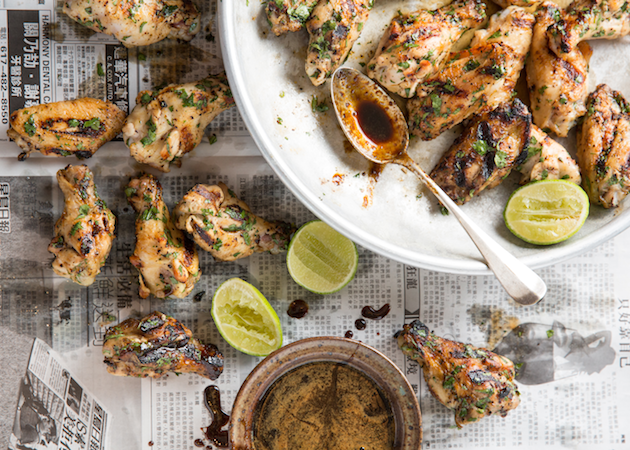 Because the marinating and sauce-making are done ahead (and because wings are crowd-pleasers for adults and kids alike), this is a great recipe for a party.